What is the "Notify Me" service? How do I submit a "Notify Me" request? Can I submit a "Notify Me" request for more than one ancestor? How many emails will I get if I sign up for "Notify Me"? Does it cost to use the "Notify Me" service? Why can't I access the newly added records for my surname? Do I have to have a MyTrees.com account to use the "Notify Me" service? I submitted a "Notify Me" request, but I never got a confirmation email. What happened? How do I remove a name from my "Notify Me" list? How can I have a list of all my "Notify Me" requests emailed to me? "Notify Me" is a service that can help you find your ancestors. New information is added to our archive on a daily basis, so it's a good idea to keep checking back with us to see if anything has been added about your ancestors recently. However, we know that this can be a time consuming process. To make it easier for you, we have created the "Notify Me" service. Just enter your ancestor's name, a date range, and your email address. Then we'll email you whenever a record matching your ancestor's information has been added to a family tree in our archive. That way, you'll know immediately when new information is available for your ancestor. To sign up for the "Notify Me" service, click here. Go to the "Notify Me" request page. Enter your ancestor's first and last name in the name fields. Select the event type (birth, marriage, or death) from the scroll box. If you would like to request a search for multiple events, you will need to make a separate request for each event. Select a year range. You can choose a range between 0 and 20 years. You will then be notified for matches that include any date within that year range. Even if you know the exact year of the event, it is still a good idea to request a search over a larger date range. A record may be added to our database that includes a slightly different year for the event, but still has valuable information about your ancestor. Select the "Register New Search" option. You will be taken to a screen confirming that your request has been received. You will also be sent a confirmation email. Click the Continue button to return to the Notify Me request page. From here, you can add another request either for a different ancestor or for a different event type for the same ancestor. You can add as many Notify Me requests as you like by continuing to follow these steps. Yes, you can submit a "Notify Me" request for as many ancestors as you like, but you will need to do so one request at a time. Once you have submitted a request, you will be taken to a confirmation screen. From there, click the Continue link to be returned to the "Notify Me" request page, where you can make another request. 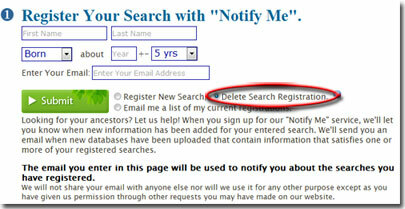 For exact instructions on how to submit a request, see How do I submit a "Notify Me" request? When you sign up for the "Notify Me" service, you will immediately be sent a confirmation email to verify that your request has been received. After that, you will receive an email when the ancestor's name you entered is added to our archive (these emails are only sent out once a day, so you will never receive more than one email per day for each name you have registered). If your ancestor had a rare name, you will get emails only infrequently. However, if your ancestor had a very common name, such as John Smith or Jones, you would probably get several emails every week. If you choose to submit requests for more than one ancestor, you will obviously get more emails. If you decide to remove an ancestor from your "Notify Me" list, you will receive one final email, confirming that the name has been removed. The email address you enter when making a "Notify Me" request will ONLY be used for this service. We will not share your email with anyone else and we will not use it for any other purpose (unless you have submitted the same email address for other services on our website, such as registering an account or signing up for our free newsletter). No, "Notify Me" is a free service. When you sign up, you will be notified by email whenever the name(s) you have submitted requests for have been added to our archive. The email will include a link to our free index, which will allow you to see additional information about the newly added name(s). This additional information could include (but will not necessarily include in every case): first name, birth/marriage/death year and place, name of parents, and name of spouse. After viewing the entry in our free index, if you decide you would like to view the full record, you can do so by making a payment or submitting your family tree. You do not have an active, paid subscription with MyTrees.com. "Notify Me" is a free service that lets you know when new information has been added to our database for a specific surname. It is not, however, a subscription to our online database of genealogical files and records. 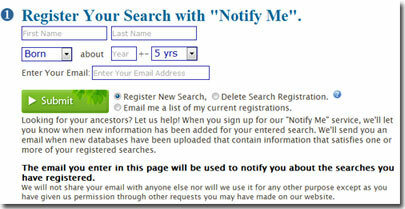 "Notify Me" is a tool that can assist you in locating information in our database. Once you have found a record you wish to view, you can do so by making a payment or by submitting your family tree. so that we can assist you further. No, you do not need to have a MyTrees.com account in order to use the "Notify Me" service. 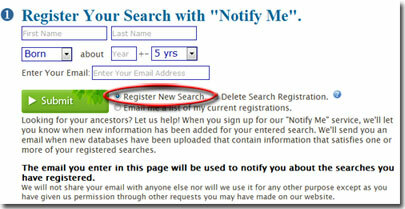 When you submit a "Notify Me" request, you will be asked to enter your email address and one ancestor's name. You will then receive an email whenever that name has been added to our archive. The email will include a link to our free index, which will allow you to see additional information about the newly added name(s). This additional information could include (but will not necessarily include in every case): first name, birth/marriage/death year and place, name of parents, and name of spouse. You do NOT need to have an account either to receive the "Notify Me" emails or to view the information in our free index. After viewing the entry in our free index, if you decide you would like to view the full record, you can do so by registering an account and making a payment. It has been less than fifteen minutes since you submitted your request. The confirmation is sent immediately after you have submitted your "Notify Me" request. However, sometimes it can take a few minutes for your email service to receive it. Please wait at least fifteen minutes and then check your email again. to your list of "allowed" senders. There was a typo in your email address when you submitted your request. If you believe that may be the case, please submit your request again, verifying that the email address is correct before submitting.
. Please include the email address and surname you included in your "Notify Me" request. Leave the event, year, and year range options blank. Select the "Delete Search Registration" option. Leave the name, event, year, and year range options blank. Select the "Email me a list of my current registrations" option. 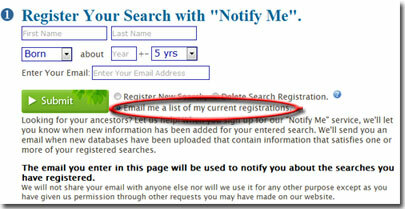 A list of your current "Notify Me" requests will then be emailed to you.
. Please include both your old and new email addresses in the message. We will make the change and send you a confirmation email.